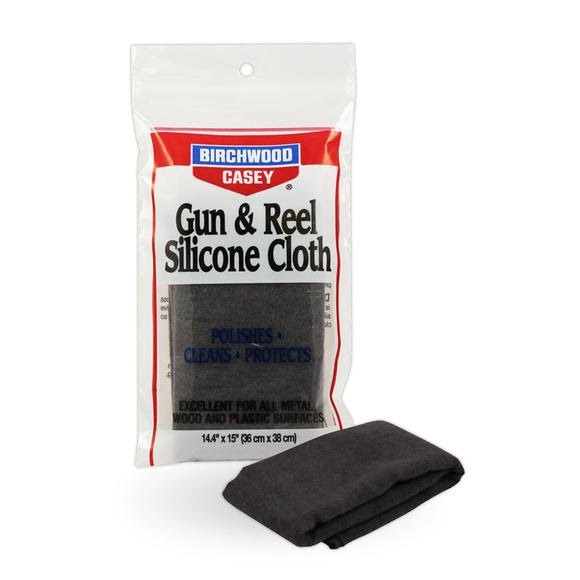 Birchwood Casey's Gun and Reel Silicon Cloth leaves a lustrous, lasting, protective film on all metal, wood and plastic surfaces. The double-napped, 100% cotton flannel cloth is impregnated with pure silicone and then packaged in a convenient reclosable poly bag, staying clean and moist after use. Birchwood Casey &apos;s Gun and Reel Silicon Cloth leaves a lustrous, lasting, protective film on all metal, wood and plastic surfaces. The double-napped, 100% cotton flannel cloth is impregnated with pure silicone and then packaged in a convenient reclosable poly bag, staying clean and moist after use. Use on firearms, sporting equipment and precision instruments to safely remove dust and corrosive fingerprints.